I've just gotten my hands on the iPhone 5s, and will be spending the weekend with it as I prepare my review. Now, based on a bit more time than I spent with one in a crowded room last week, here are some of my first impressions of Apple's new top-of-the-line iPhone. I've been carrying an iPhone 5 in my pocket for the last year, and the iPhone 5s feels exactly the same. Same curved edges, same dimensions, same everything. All cases and accessories for the iPhone 5 should fit without a problem, because it really is the same form factor. Only the updated home button and the flash give away that this is not an iPhone 5. Well, and the color. My beloved Darth Vader iPhone (slate and black) has been displaced by a slightly less aggressive gray, but for my review unit I opted for the gold model. It's very attractive. I don't get the silly backlash I've heard against gold iPhones in general--were people expecting some sort of gaudy monstrosity from Apple? If so, that was silly. 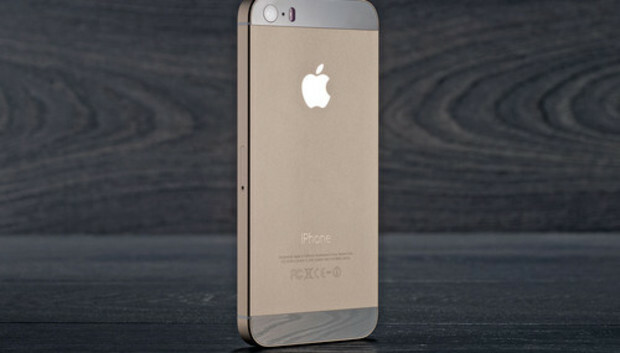 This is a gold finish that's very much the counterpart of the silvery aluminum finish on last year's white iPhone 5. Some people like gold and some like silver, and that's fine, but the gold iPhone is not a bad look at all. I'd personally still prefer a darker one, but I wouldn't be embarrassed at all by a gold iPhone. The home button's the big change here. The old rounded-rectangle silkscreen on a slightly concave button is history. Instead, there's what seems to be a subtly smaller circle, flat and ringed in metal. The button click feels a bit firmer, a tiny bit like switching from a scissor-key keyboard to one with a mechanical switch. Of course the home button is different because it's not just a button anymore, it's a Touch ID fingerprint sensor. I've trained a couple of different iPhone 5s units to read my fingers now, and it's a relatively easy process. I keep wanting to tap my finger rapidly on the scanner, but that's not the way to do it. Patience is required, and the helpful training screen will tell you when you need to pick up or place down your finger. Once the phone has gotten the core of your print, it'll ask you to reposition the phone so that it can scan the edges too--the parts that might not be scannable when you press your finger on the button in the standard position. The iPhone 5s can store up to five fingerprints. At last check, I've got 10 to choose from, so I've found myself wondering which ones to store. I never really thought about which fingers I use to press my iPhone's home button before. So far I've scanned the left thumb and the right index finger. I'm looking forward to seeing which other fingers come into the mix. Unlocking the phone with Touch ID is seamless. If I press the home button with a recognized finger (and isn't that a weird phrase?) and leave the finger on the button after the press, the phone just jumps to the home screen. It's going to be really easy to get used to it. Clearly Apple has put a lot of thought into the software that's been assembled around this scanner. Not only is the fingerprint-learning process handled in a clear, friendly way, but the unlocking process is smartly done. After three failed attempts to scan a finger, the numeric keypad slides in. "Don't get frustrated," it seems to be saying, "Maybe it's better if we do it this way." Each failed attempt to read a print also generates a nice (but subtle) message: the Slide to unlock text changes briefly to read Try again. Adding a fingerprint sensor as a key new feature in the iPhone seems like an audacious move to me; this is weird, sci-fi technology that risks being severely ridiculed if it doesn't work right. I'm struck by just how normal Apple makes the whole process feel; there could be blaring horns when a finger fails to be read, and the sound of a bank vault unlocking when a finger is recognized. There's none of that. It's all subtle and out of the way. Fast, yes, but how fast? Okay, we know the iPhone 5s is going to be fast. When Apple introduced the thing, it claimed speed boosts of up to 2x were in the offing. But companies say a lot of things about their new products. What does reality say? I didn't think I could notice a difference between speed on the iPhone 5 and its successor; I mean, really, the iPhone 5 is pretty darned fast on its own. But the moment I started launching apps on the iPhone 5s, I could tell that it was a lot faster. Particularly troublesome or ambitious apps, ones that bog down on my iPhone 5, ran smoothly on the iPhone 5s. Twitterrific 5, my iOS Twitter client of choice, can get a little ropey when it's loading a large batch of new tweets. It's accessing the network and drawing a whole lot of text, all at once. On my iPhone 5 (and even more, on my iPad mini) it's best to take a deep breath and let the tweets load before trying to do something. On the iPhone 5s, there was no delay, the scrolling never hiccuped--everything that app had to offer me, it offered without hesitation. So is the iPhone 5s twice as fast as the iPhone 5? Not in every case, but in a whole lot of them, the answer is yes. More importantly, for those iPhone 4s users who are coming off their two-year-old phone contracts: The iPhone 5s's GeekBench scores were six times faster than the scores of the iPhone 4s. I've taken a few flash shots with the new iPhone 5s camera, and even a few slow-motion videos, and those features seem to work as promised, though I need to spend a lot more time taking photos and video before I can form final conclusions on Apple's upgrade to the iPhone's camera in the 5s. That's what I'll be doing next: Spending a lot more time with the 5s so I can write the full review. Taking pictures, surfing the Web, maybe even answering a phone call or two. In the meantime, stay tuned to Macworld for much more about the new iPhones and iOS 7. And don't miss my first impressions of the other new iPhone, the 5c.